An estimated 10 million people, owning half of Kenya's livestock population, are directly dependent on their fragile arid and semi-arid lands for survival. 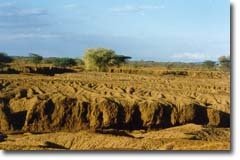 The degradation of Kenya's drylands has led to serious environmental and socio-economic problems. Many of these problems are exemplified in Baringo District, covering almost 9,000 square kilometers with a growing population of 400,000. 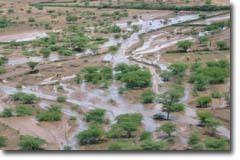 Land degradation is severe in the Baringo lowlands, with little or no vegetative cover and diminishing biodiversity. Erratic rainfall and high intensity storms cause heavy runoff and flash flooding. Erosion, exacerbated by deforestation in the foothills, is silting up Lake Baringo, the only large source of fresh water in the area. Overgrazing of diminishing communal reserves and the abuse of limited natural resources has accelerated. A breakdown of ‘traditional’ values further hampers people’s ability to cope with their changed reality. Grazing conflicts between ethnic groups has increased insecurity, with boundaries and land tenure policies remaining ill defined. Reduced employment and income generating opportunities have resulted in males migrating to urban areas, leaving women with double the workload. The recurring cycle of droughts and floods has become commonplace, with poverty increasingly widespread. The RAE Trust has worked closely with agro-pastoralist communities for over two decades to successfully develop Kenya’s dryland potential. 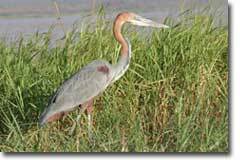 •	The successful reclamation of degraded semi-arid land. •	The establishment of sustainable community-based land management and utilisation systems. 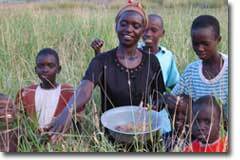 •	The improvement of livelihoods through income generating opportunities from productive grasslands, particularly those of women and their families. •	The dissemination and transference of knowledge based on long term research, practical experience and effective collaboration. In Baringo and elsewhere increasing numbers of local people contribute actively to the community-based solutions developed by RAE reaping multiple socio-economic benefits from their once degraded lands. Local people and the environment benefit directly from RAE's clear, tangible achievements, which also have long term broader impacts. including indigenous aloes; a database of more than 20 years environmental and socio-economic information and experience, including an on-site herbarium of over 1,000 local species with ethno-botanical information; the successful establishment of 10 diversified income generating opportunities for both men and women, with improved markets for field products such as grass seed, hay, honey and fattened livestock; a Clinic providing primary and reproductive healthcare services; hosting of over 400 visitors per year with an on-site training programme established targeting educational institutions, semi-pastoralist groups, youth and women; the wide dissemination of results, and collaboration with partnerships locally, nationally and internationally. 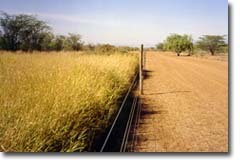 sustainable income generation from reclaimed areas with a shift from a ‘traditional’ livestock economy to a cash economy meeting ‘modern’ needs, such as school fees; an increase in value of once denuded wasteland, initiating community driven land ownership and utilisation reforms that affect policy decisions; the transference of knowledge to an ever expanding group of pastoralists in other dryland areas, leading to a growing rate of adoption and replication of RAE initiatives that improve the social and environmental conditions of Kenya's vast arid and semi-arid regions.